Yellowed cards, e-mail updates, and social media threads — these communiqués to professors show appreciation from their students over the years. 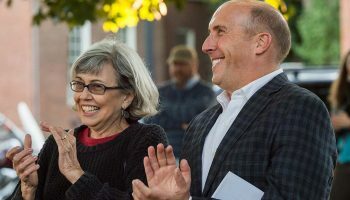 Beyond a simple “thank you,” the correspondents revealed that their professors oftentimes helped to make the seemingly impossible possible: think in new ways, finish a thesis, determine a career path. 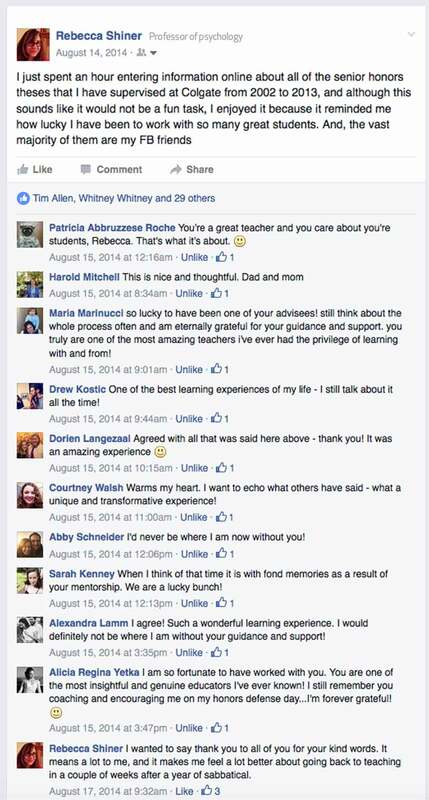 Through these experiences, they formed a bond; the teachers became mentors and friends. I don’t know if it is possible to convey in words the sense of gratitude I feel. Being able to take classes with you, having you as my advisor, mentor, teacher, and friend over the past four years has been one of the best things to happen in my life. You have inspired me to achieve at a level higher than I thought possible. Your guidance and encouragement during the thesis process was invaluable — without it I most surely would have been lost at sea. I have discovered a passion for learning and exploring, for asking questions that weren’t even on my radar four years ago. For that I am forever thankful. I cannot begin to describe how important it was for me to be able to seek your advice throughout the thesis process — especially in the spring. 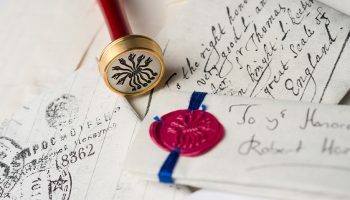 I’ve talked about this with my peers and we have all come to the conclusion that talking about our theses with you made it feel possible to complete the project. I knew that even if there was a significant problem with my thesis, talking with you would inspire me to make the project better, rather than giving up or feeling depressed. I don’t know if you ever saw our faces after we left your office. More often than not we were smiling. We were happy because you had helped us discover a new reserve of enthusiasm and energy that we didn’t even know we had. You saw in us — in me — the ability to complete the thesis helped us achieve that goal. Throughout my Colgate career I have found it rare to be so encouraged after talking with a professor. 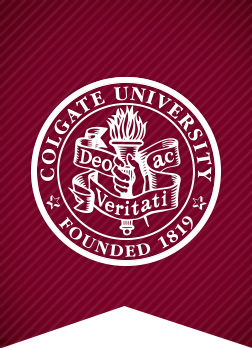 I also can’t tell you how happy I am that you will be staying at Colgate! I truly believe there is no one to better represent this institution and its ideals, and I know that future Colgate students will benefit in so many ways from having you here. I feel so honored and blessed to have been able to learn from you, and am absolutely thrilled that Colgate has finally discovered how invaluable you are! My parents are Colgate alums, so we share a special Colgate bond. But there is another thing I will be able to share with them as well: discussing and continually thanking the professor who has had the biggest impact on our lives. I can’t thank you enough for everything — the advice, guidance, and thoughts on life. I am going to miss the day-to-day banter and ability to drop into your office to talk, but I hope we can stay in touch! Thank you for making my Colgate career everything it has been. I took your Introduction to Religion class in the fall of 2007, and have thought of the class and your words often. You welcomed us into your home on Halloween night, you brought us along on your hunt for Christmas trees, and most importantly, your “those of us” approach to life inspires me to open-mindedness and empathy to this day. Incidentally, I also met my fiancée in your class. Her name is Arianne Templeton ’10. We always felt a very strong bond knowing that we had been lucky enough to see a small part of your practice of sharing in faith. Years later, your name still often comes up as we discuss faith-inspired conflicts and misconceptions around the world and in our own experiences. To that end, I was wondering if you might be willing to join us at our wedding on July 30, 2016, in Brookfield, CT. We would be so honored to have you there, and would consider ourselves fortunate to be in the company of your inspiring philosophy. Just this afternoon I was visiting my parents for Mothers’ Day, and we were watching Cosmos (with Neil deGrasse Tyson). The episode focused on the evolution of the planet. When the host started to build up suspense about a certain disaster in the Permian era, I piped up and said, “Oh, the P/T extinction event! Ninety-six percent of all life on Earth perished!” I had a similar comment before the host mentioned what creatures survived the meteor that killed the dinosaurs — at which point, my mother paused the playback to demand how I knew this stuff. And, of course, it was because I remembered it from your class. I wanted to say how interesting and fulfilling a course it was, and how dynamic you made it, that I still remember details (a lot more than those two) 15 years later. I hope I can incorporate some of these facts and information when I develop a unit on dinosaurs for my classes. I am so pleased and grateful that I had the experience of your wonderful teaching and the intriguing course to help me make my own teaching better. Thank you. Being part of my life! I want to thank you for everything you taught me this semester; it proved to be invaluable. I am in London working at Citi for the summer in the CEEMEA (Central and Eastern Europe, Middle East, and Africa) desk in the trading division. As summer analysts, we have to attend training sessions for whatever division we are in within the bank. Being in the trading division, I have to attend sessions on FX, trading concepts etc. I was really worried that I was not going to do well since we do not have finance classes at Colgate. However, to my surprise, I turned out to get the highest scores in our evaluations, and my partner and I are ahead on the FX game (mock currency trading competition) — and it was all because of everything you taught me. So, thank you again. I am (finally) finishing my recording of voice and guitar music, and it should be released this November on Origin Classical as well as iTunes, etc. I have thought of you so much during the process and just wanted to send you an eternal thanks for all your help and support over the years. You have been such an inspiration and I owe you so much! I could never have undertaken this project (and career!) without you. Head of Vocal Studies, Music Dept. 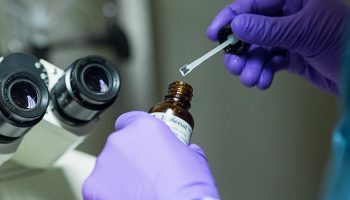 I wanted to drop you a note to let you know that I mentioned your Molecular Biology Seminar course as my inspiration for working on DNA Repair in an editorial that I wrote for Molecular Cell. It really was a great class! At Teachers College this week was the first week back in school, so it has been a busy week for me! I was reading for one of my classes, and this article made me think of you so much that I had share it with you (“Women and Men in the Classroom: Inequality and Its Remedies,” On Teaching and Learning, Volume 1). I also want to say thank you, Professor Dudrick, because you are truly an amazing professor. You had the most impact on my academic experience at Colgate, more than you’d know. As an introvert, and due to my different cultural values that I grew up with (students must be listening, rather than speaking in front of teachers), I always had to challenge myself to raise my hand in class even when I had so much in my mind that I wanted to contribute to the discussion. As it says in this article, it really helps female (or introverted, or shy) students to participate if the professor waits longer for the students’ response, and looks around the whole classroom, instead of letting a few students monopolize the discussion. 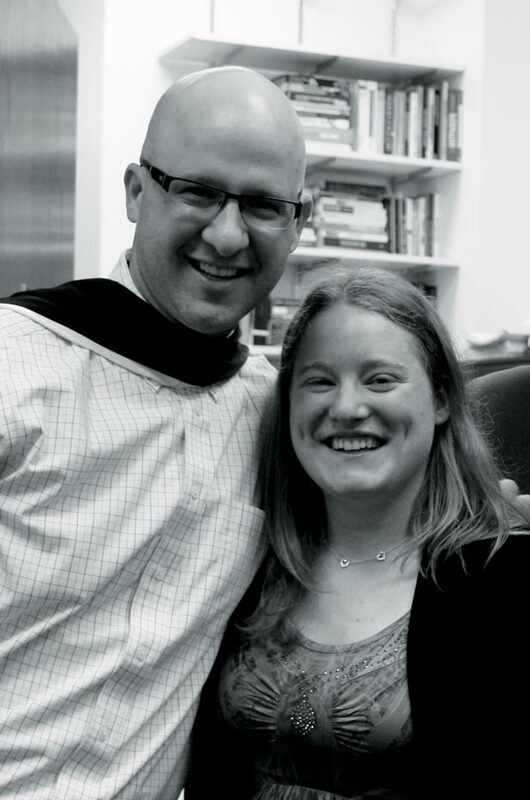 Looking back at myself in your Philosophy of Religion class (my first philosophy class), whether you were consciously doing it or you are naturally an amazing educator, I deeply appreciate how much your lecture style had encouraged me to speak up in class. It gave me confidence, which drove me to be more passionate about philosophy, go on a study abroad, take the Proseminar course, and writing an honors thesis with you. Thank you, Professor Dudrick. As I study more about higher education and student development (my focus is on leadership development in minority students), I admire and appreciate your influence on me more and more. 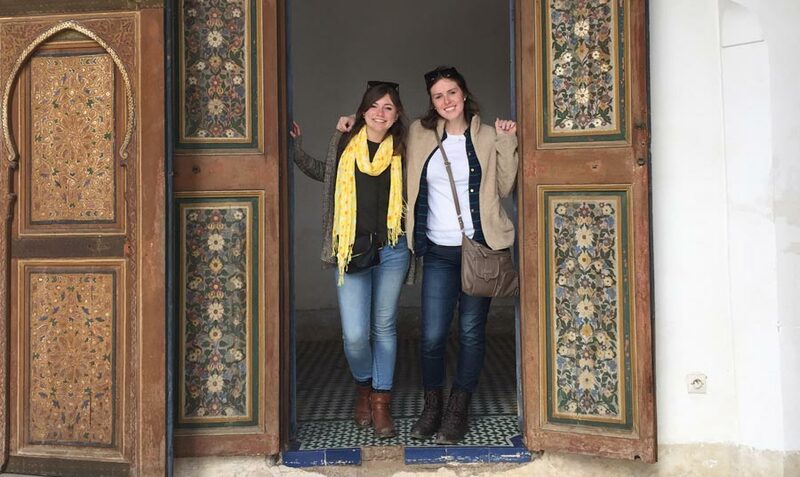 When Meredith Reynolds ’16 (pictured, on left) studied abroad in Morocco last spring, she “had been really bad about sending postcards,” she said. 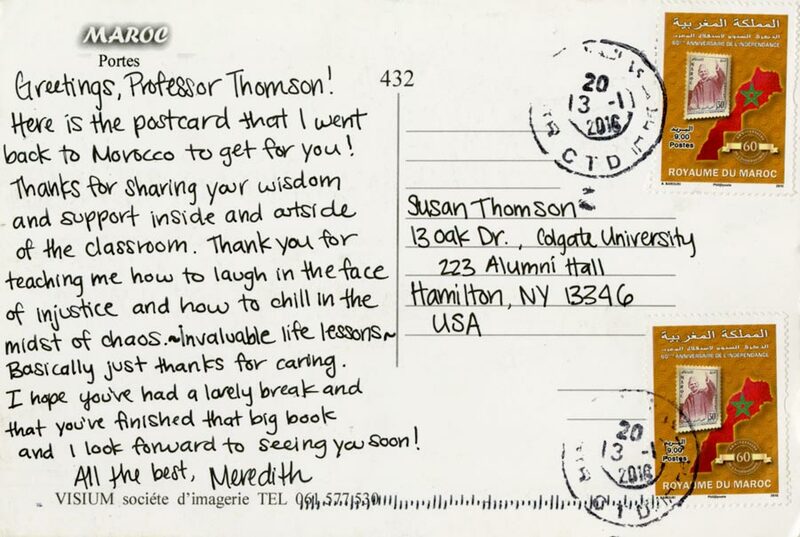 So when she returned to Morocco in January on an AMS grant, she told Professor Susan Thomson that she was going back just to send her a postcard. Here is the postcard that I went back to Morocco to get for you! Basically just thanks for caring. I hope you’ve had a lovely break and that you’ve finished that big book and I look forward to seeing you soon! I am finally all settled in [UC] Berkeley and just started classes today. My cohort is quite small (just 7 people) but very diverse, and luckily there is one other person in my group doing sociology of education. They pretty much have us doing foundational coursework for the first semester — quantitative methods (statistics), qualitative methods, theory, and an optional elective/content focused course. Expect random jottings from me for the next 6–8 years! I’m really enjoying class so far and I can’t wait to use your Pope nickname next semester! Not sure if you remember me from my CORE India days at Colgate, but I wanted to reach out and say hello. 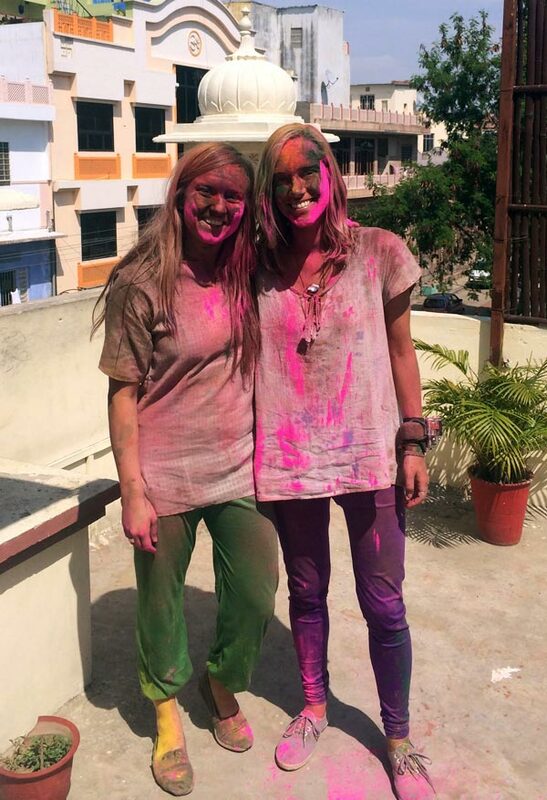 I am extremely excited to share with you that I finally have the opportunity to head out to India this spring. I was hoping for some teacherly wisdom on what I must experience my first time in South Asia. I also wanted to let you know that I never would have had fostered and sustained my passion and love for South Asia if it wasn’t for you. Your constructive guidance, tailored attention, and inquisitive instruction throughout my time at Colgate was both humbling and inspiring, and I truly can’t thank you enough. Rishikesh, back to the Golden Triangle, and then ended in Mumbai and Goa. Even though you’re technically no longer my professor, I still hope to keep in touch as you continue your travels and studies, and as I start down the path of finally pursuing mine. Thank you again for everything you’ve shared with me over my years at Colgate, and I plan to keep you posted on my adventures down the line! I just wanted to thank you for being one of the most energetic and hilarious professors I know. When we were given torch medals, I knew I wanted to give mine to you. (I didn’t realize that giving it to you this late would mean that you couldn’t go to the brunch, but hey! better late than never!) You have honestly made a great impact on my Colgate career. And some of the hilarious jokes and advice and adventures from Martinique will continue to help me grow as a person after I graduate. You are the epitomé of a great professor and a role model for not only your students but your fellow professors as well. 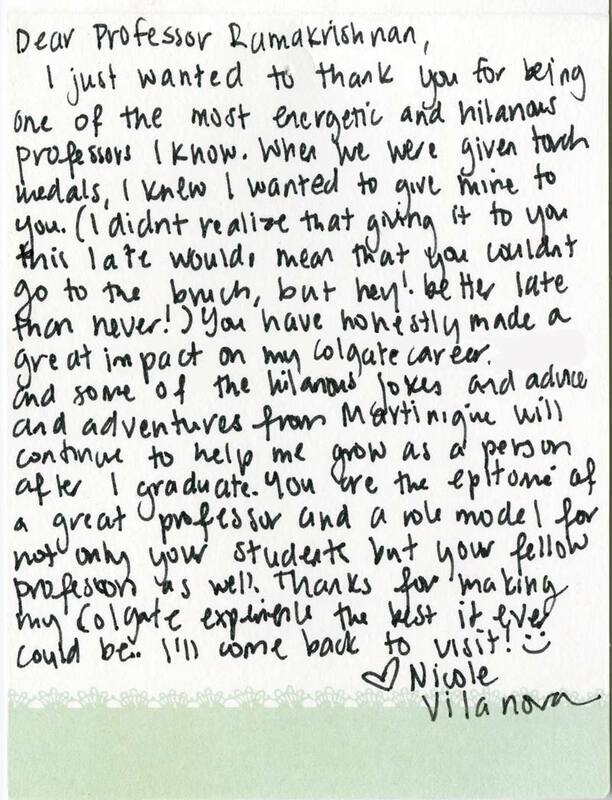 Thanks for making my Colgate experience the best it ever could be. I’ll come back to visit! 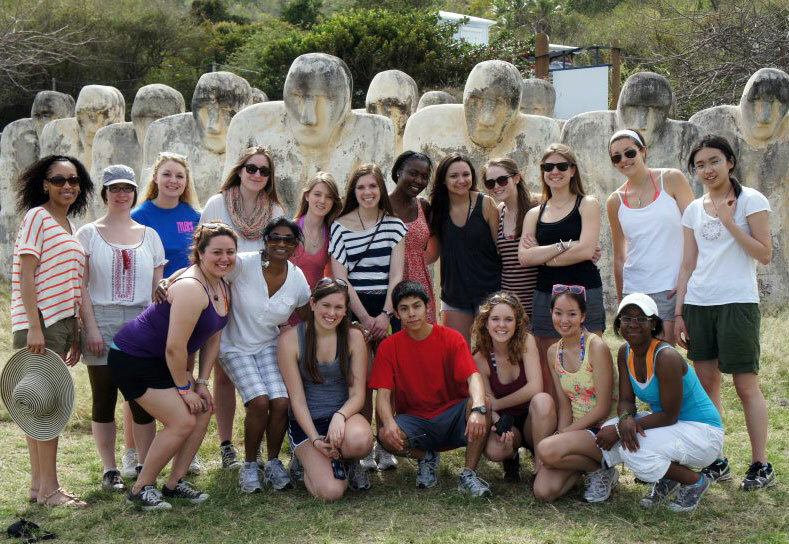 Nicole Vilanova ’13 (top row, fifth from right) went on an alternative spring break trip to Martinique with Professor Mahadevi Ramakrishnan (bottom row, second from left). I can’t even begin to thank you for all that you’ve done for me. I was a little late for the Saracino train (our first class together was my junior year) but, boy, did the last two years really matter. I remember having heard so much about you before Abstract Algebra II and Number Theory II and was afraid people were going to overhype you. Thankfully this was not the case. Abstract was by far the most fulfilling experience of my academic career (I still have your book on my desk and reference it often), and I daresay of my life. To be honest, the main thing I wanted out of the class was proving angle trisection impossibility. I really didn’t know about Galois theory or solvability, but I was blown away by those lectures. It’s very tough to describe the satisfaction of waiting seven years for something and finally getting it. I really do put the whole Abstract II experience on the same level as something such as seeing the Eiffel Tower or shaking the president’s hand (true story!). Anyway I do truly thank you for helping make me the person I am today. Taking your classes has greatly expanded my ability to problem solve, and also given me a stronger sense of confidence in myself, and my ability to tackle problems. 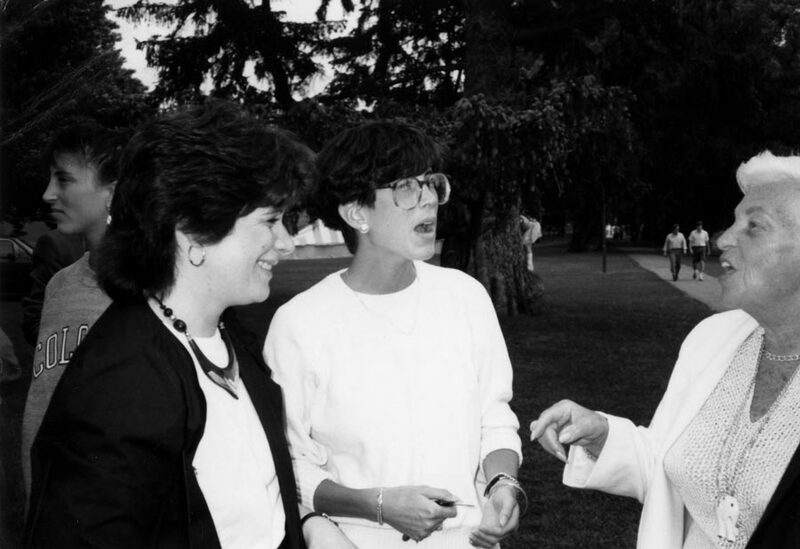 Professor Rhonda Levine (left) with Deborah Fox Rush ’86 (center) and Deborah’s grandmother at commencement. Rhonda Levine was recently given the 2016 Jerome Balmuth Award for Teaching. I am a senior trial defense attorney with The Legal Aid Society, Bronx, New York. I am in charge of the Juvenile Offender Practice for the Criminal Division in the Bronx. There was a lot of discussion about Marxism and class inequality. Rhonda taught me to think critically about the world. She also made me a much better writer and factual reader. In fact, I still enjoy reading nonfiction books with a society lesson in them. My entire legal career has dealt with the issues of poverty and class inequality and its impact on defendants in the criminal justice system. The lessons I learned in her courses clearly started me on a path to my lifelong career. I was a student of yours a few years ago. I loved taking your courses. Your analytical style appealed to the scientist in me. I eventually became a veterinarian, and now I’m pursuing a master’s degree in computer science. …You taught me how to think. The skills I acquired analyzing prose have been a big help with my avanced mathematics courses and my software engineering studies. You can tell your students with confidence that your instruction will serve them well no matter what they decide to do later in life. Thanks, Dr. Knuth! I am hoping that from now on, choral music will always be a part of my life.